It has always been "known" that if you want serious race wheels, you need tubulars. They roll smoother, handle better, can tolerate higher pressures, are lighter, and spin up better. All of these things have been basic truths of bicycle lore for decades. For those of us who would prefer not to scrape glue off of a rim when we get a flat, we have good news. Time trial specialist Tony Martin recently ignored these myths and rode a set of HED Jet clinchers to victory, defeating the legendary Fabian Cancellara to become world time trial champion in 2011. Clinchers just as good as tubulars? 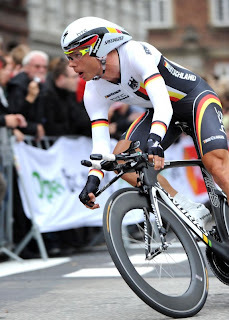 A tough pill to swallow for most, even if Tony Martin says so. But the arrival of top notch clincher tires, latex tubes, and new clincher wheel offerings from HED, Zipp, and others has made it a reality whether the old guard believes it or not. The newest iteration of the HED Jet line brings improved aerodynamics and reduced weight, allowing you to have your cake and eat it too – you can change tires easily, but go just as fast. HED's Jet line has always offered an affordable yet fast and high quality alternative to more expensive brands like Zipp, as well as the convenience of clinchers and aluminum brake tracks. The Jet wheels are built out of conventional metal rims, with the aerodynamic shape being created from a thin carbon fiber fairing. This means the wheels handle just like ordinary wheels and share the reliability and ease of maintenance of normal wheels, but cut through the air with a lot less drag. No more picking tubular glue off the rim, no more changing to carbon-specific race pads, just throw the wheels on and race. NEW for 2012 - The JET line gets a new shape, noticeable at first glance as the inside edge of the rim is much meatier. 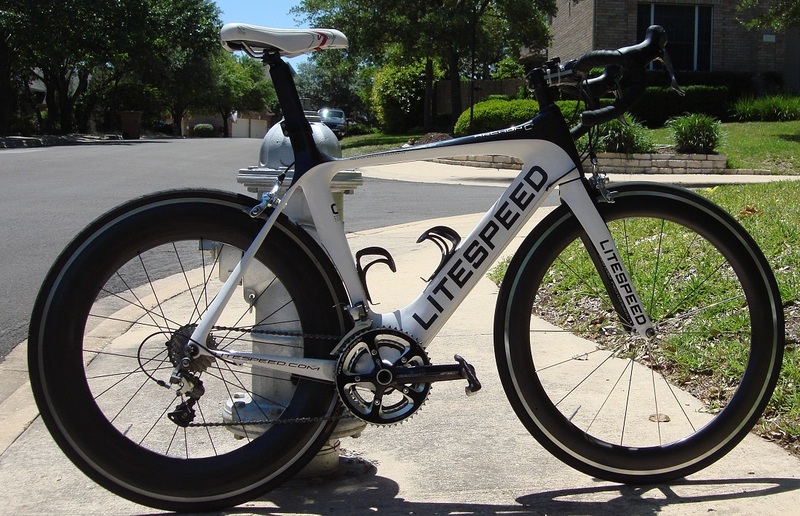 This has been the latest trend in aero wheel offerings, said to provide less drag and better stability in crosswinds. 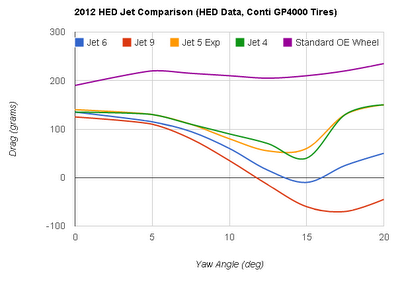 HED claims that the new shape gives the JET the same aerodynamic performance as their tubular Stinger line. NEW for 2012 - The new unidirectional carbon is lighter and stronger, allowing for the new aerodynamic shaping, as well as reducing the weight of the skin by up to 54 grams. Above, you can see a closeup shot of a 2012 Jet 6 on the left compared to a 2011 Jet 9 on the right. Notice the thicker inner edge and different carbon style. Click for a closer view. C2 Wide Rims - Jet Wheels continue to have an extra wide rim, which can help to improve handling and overall aerodynamic performance when the wheel is equipped with 23mm or wider tires. Road racers absolutely benefit from this feature, as they almost always run 23mm or wider tires. 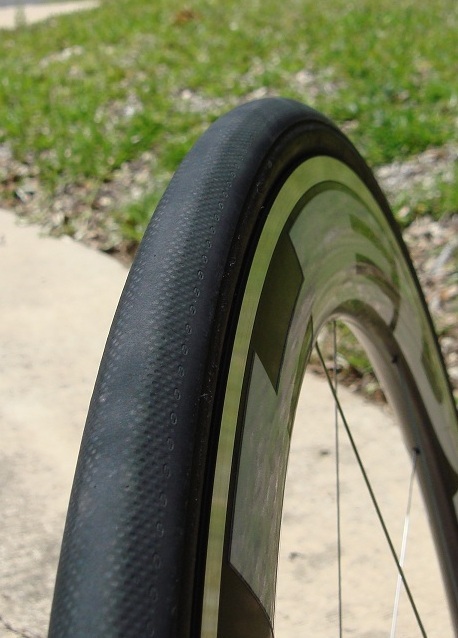 Triathletes and time trial specialists should keep in mind that even with these wide rims, narrower tires are still generally a faster option for races against the clock. 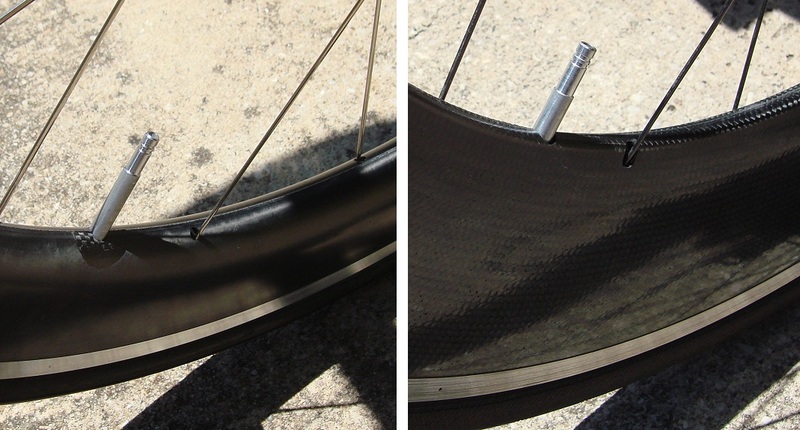 Click the picture to see a closeup view of how a Zipp Tangente 23mm tire mates up with the wide rim on a Jet 6. Notice how the tire doesn't bulge out past the rim itself, for cleaner airflow. Aluminum Brake Track - Few other aero wheels of this caliber offer the feel and convenience of a standard metal brake track. No longer do you have to engage in a ritual of brake pad swapping, or pray that it doesn't rain. These rims brake just like your training wheels, no special pads required. Clincher Convenience - Got a flat in the middle of a stage race? Want to switch to a different tire because of rain? Can't resist the urge to train a bit on your race wheels? With tubular race wheels you are out of luck, with clinchers, just change the tire! 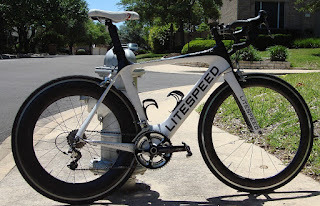 Put on a super narrow, delicate tire for an olympic tri, and put a wider more durable one on for a rainy ironman. Tire selection is such a key part of overall bike performance that this can be a huge benefit. Flamme Rouge - In the past you had to pay extra for the lightweight Flamme Rouge feature, but now most Jet wheels come standard with these beautiful carbon hubs that save a bit of weight and look pretty sweet. Customization - HED can build wheels to suit your needs. Larger athletes can get stallion builds with extra spokes, an array of custom colors are available, and most of their wheels can be built with a Powertap hub upon request. Other options include track versions, 650c versions, and even wheels for recumbents. HED is even nice enough to ship their wheels with stickers that peel off cleanly and easily for those who prefer the stealth look. Snapple-ATC's Kat Hunter will be on HED Jets for the Tour of the Gila 2012! The following is a compilation of data from the HED Website for their 2012 Jet Clinchers. This is marketing data so use it at your own risk. It may be useful in comparing the relative differences between the HED Wheels, but these numbers are not comparable to wind tunnel results from other sources, as protocol details (tire choice, tunnel calibration, etc) could be completely different. Yaw angle is the angle of the wind as it hits the wheel. Very fast riders or windless days will be at lower yaw angles. Slower riders or very windy days will be at higher yaw angles. As a rough rule of thumb, each 50 grams of drag will save about 0.5 seconds per kilometer, or 20 seconds over 40k on a flat, straight course. HED currently offers the Jet lineup in a variety of sizes from shallow to all-out disc wheels. All wheels ship with skewers, rim tape, and valve extenders. Stop by ATC and give them a try! April 2, 2005, was the first year that I drove to Galveston for their annual triathlon. I don’t even remember what they called it back then, but it was a tiny race of no more than maybe 300 people spread over a 70.3 and Olympic distance race. In the coming years, EndorFUN Sports took over and turned Galveston into LoneStar and into a first-class racing experience that drew participants from all over Texas. It still had the small-town feel to it, though, and I enjoyed racing with my friends, knowing over half the participants. The pro field was small and the race was more about the age groupers and their 70.3 experience. In 2011 that all changed. Ironman took over and LoneStar became the Memorial Hermann Ironman 70.3 Texas and a qualifier for 70.3 Worlds. The feel became more corporate, and the competition got tougher. Pros started showing up to toe the line, and before you knew it, Galveston became a destination race, with participants traveling from all over the U.S. and from other countries, as well. 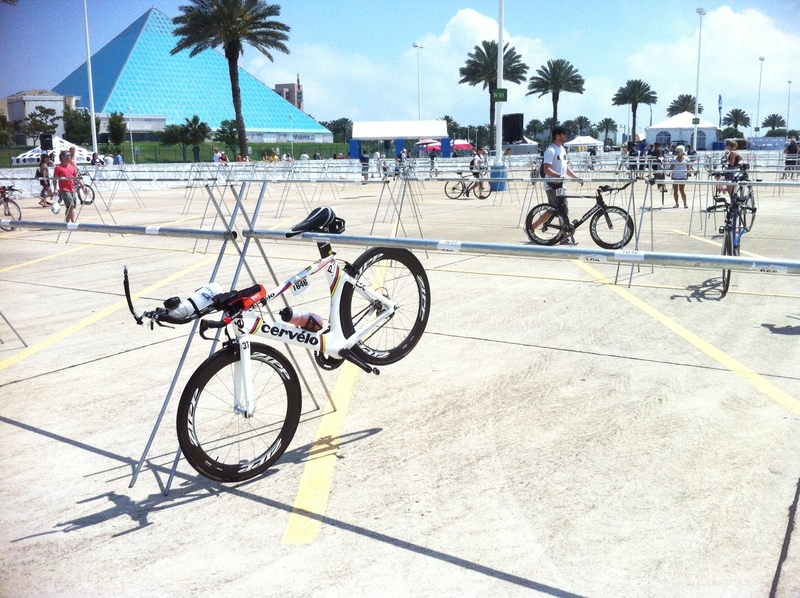 2011 was the second year that Galveston was to be an Ironman event. This year, the pro field was stacked, and with the announcement that Lance Armstrong would be racing, the race filled as did hotels all over Galveston. If you decide to sign up and race Galveston, let me suggest getting there the Friday before the race to pick up your packet. This year, due to work obligations, I arrived on Saturday and went straight to Moody Gardens, the fun, family center where the race is held. I had to park over half a mile away and waited almost 30 minutes in the sun to pick up my packet and fill out my waivers. Mandatory bike check-in is on Saturday, so after waiting in packet pickup line, I wandered over to the bike drop-off line. I had to laugh at the number of women, myself included, taking pictures of their bikes hanging lonely from their place on the rack. My business done for the day, it was now time to find my friends and head to an early dinner. Race day dawned windy and humid, which is typical of Galveston. My friends and I made our way to Moody Gardens, arriving at 5:30 a.m. to a line of cars that stretched around the block. By 5:50 am we were parked and walking the one-mile trek to transition. By the time transition closed at 6:45am, I had everything ready, was at my spot, and was relaxing in the grass waiting for the pros to start at 7 a.m. My wave wouldn’t go off until 8:05 a.m. That would give me plenty of time to watch the pros exit the water and then to meander my way roughly a mile to the swim start. Around 24 minutes after they started, a group of guys erupted from the water and there were some polite claps and “good jobs.” Then Lance Armstrong came out, and the crowds went wild. There were cameras following along as he made his way towards his bike and people rushing along beside him. I kind of felt sorry for him. I’d hate to have that much attention on me while trying to smoothly make my way through T1. Back to my race... The swim begins with a deepwater start. My wave hopped in and we treaded water, taking our places as well as taking care of last-minute business. Don’t open your mouth in the first 100 meters of the swim. I yelled out a “Have Fun,” and all the women erupted in cheers. Then the horn went off and we forgot our goodwill and started hacking at each other while we fought for our bit of water. The swim starts straight into the sun for 400 meters, so bring your tinted goggles. You then make a very sharp left-hand turn and head west for about 1,000 meters, making another sharp left to head in towards shore. I exited the water and was excited to see wet suit strippers! They got my suit off on the second try, and I was up and running towards my bike. On went the sunglasses, helmet, race number, then shoes, in that order. I grabbed my bike and un-racked it right into my neighbors transition items. She had set up her transition under my back wheel. Big no-no on her part and a big problem for me as my tire valve hooked her bag. I pulled and when I did it pulled my valve, letting all the air out of my back tubular. With some effort, I unhooked the bag from my wheel, not realizing what had happened. I ran to the mount line, executed my clumsy mount and immediately knew something was wrong. I hopped off again, and the whole time volunteers are yelling at me to get going. This is when I wish triathlon were like road racing. I’d really like a neutral wheel, and someone to help me put it on, about now. I'm desperately hunting for a bike mechanic. One volunteer pointed me back into transition where the mechanic tent was set up, on the complete opposite side from where I am now standing. I start hobbling back that way, as fast as my bike shoes will let me go. Halfway there I realize there is no one in the mechanic tent so I turn around and hobble back out, again. Note to Ironman - I was not the only one having issues at this point. I believe it would be a good idea to have more than one bike mechanic in bike transition. A volunteer tells me there is a SAG vehicle about 100 meters around the first turn. Side note - I do have the Fix-A-Flat can on my bike, but I run tubulars and I only have the one can. I’m saving it for a possible flat out on the course. As I’m heading to the SAG vehicle, which I’m just hoping is there, I see a spectator on the side with a pump. I ask to borrow the pump (yes, I know this is illegal) and pump my tire up. I send up a quick prayer to the tire gods and off I go. The Galveston bike has and always will be windy. There is no real headwind or tailwind, just a constant side wind. I think it must be a little bit like Chinese Water Torture except instead of a constant drop of water, it’s the constant blowing of the wind. The course is as flat as a pancake so be ready to be aero the entire 56 miles. With around 10 miles till the turn around, I started noticing the bumps were a little more pronounced and realized my tire was going flat again. I figured I’d make it to the halfway point, find a volunteer with a pump, and pump it back up. No such luck, though. There was no pump or SAG and I decided it was time to pull out the Fix-A-Flat. The Fix-A-Flat shoots air along with some sort of miracle foam into your tube. It helps to plug up leaks, which I obviously still had, and air up your tire, all in one. It didn’t get me back up to my 120 psi, but good enough, and like the Willie song says, I was “on the road again.” The tire held and I made my way back to T2 and the 13.2 miles of hell to come. 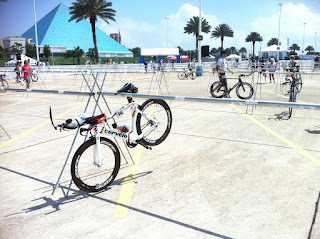 Back into Moody Gardens, off the bike and onto the run course. I want to make a comment here. I really wish that they would let us run along the sea wall. Not only is it cooler out there but to have the chance to run along the Gulf would be spectacular. Instead, they force us to run three loops around buildings, through parking lots making a funny “L” shape turn, out in the middle of the air field. It is hot, with not a breath of air in parts, boring, and fairly unimaginative. The volunteers are great, though, and there are areas where the crowds are thick and their cheering spurs you on. By the third loop, I was cooked. The salt water having removed my sunscreen, I was sunburned and could feel the multiple blisters on my feet. I shuffled my way towards the finish line, crossed it to the incorrect pronunciation of my name, and got my finishers cap and medal. At the end of the day, what mattered most was that I traversed the obstacles before me and finished. Actually, what mattered more was that there were margaritas and great seafood ready to be eaten in celebration of another race done!